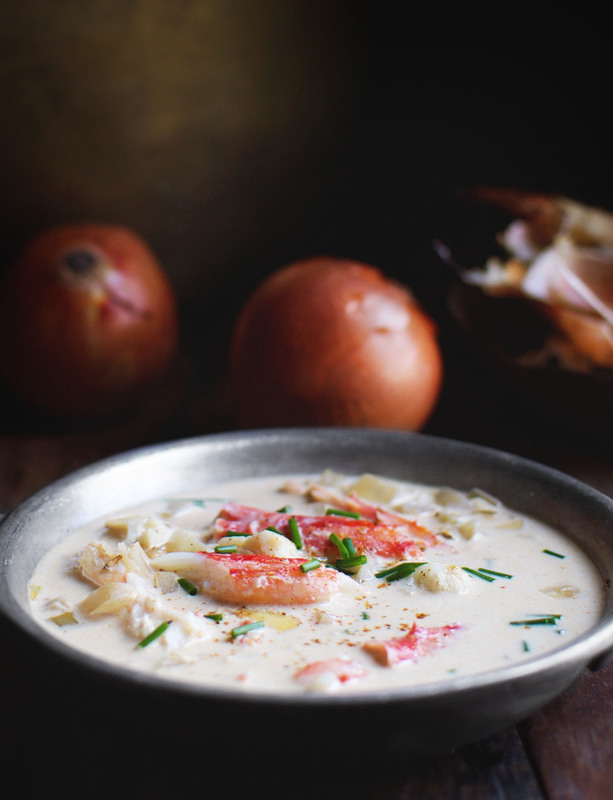 This Low-Carb Crab Chowder recipe makes a delicious soup for a cozy lunch or dinner. This soup contains no grains and is low-carb, LC/HF, ketogenic, diabetic, Atkins, gluten-free, and Banting diet friendly. This Low-Carb Crab Chowder boasts a creamy base with hints of garlic, spices, thyme, and a bit of heat from crushed red pepper. Onions and celery add flavor and texture. Diced chunks of a cauliflower stalk stand in for the traditional potatoes to decrease the carb content. Chives give flavor and a hint of green. Of course, the main attraction of the dish is the tender, sweet crab meat. Usually when I use a head of cauliflower, I trim off the tender florets and discard the cauliflower stalk into the compost bin. I don’t like to throw food away, so I have been contemplating how I can use this bit of the cauliflower. I decided to chop it into little cubes that look just like diced potatoes. I find that these little cauliflower cubes make a great substitute for potatoes in soups and chowders. The cauliflower florets are left over for another dish. The crab meat I used in this dish was from a single frozen cluster of crab legs. They were previously cooked and scored, so all I needed to do was defrost them under cold water and remove the meat. Canned crab meat would work fine in this recipe, but wouldn’t be quite as pretty. Just be sure to pick through it and make sure all of the shell is removed. 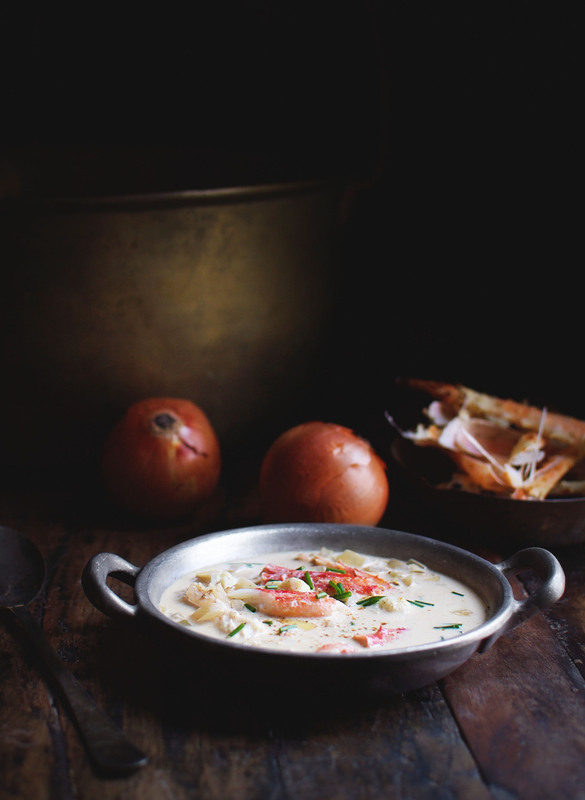 This chowder makes a great lunch or dinner on a chilly day. Serve it with a salad to make a complete meal. Enjoy! Heat a large heavy sauce pan or Dutch oven over medium heat. Add butter. When butter is melted and stops foaming, add the diced cauliflower stalk, the onion, and the celery. Sprinkle vegetables with salt. Cook, stirring occasionally, until edges start to brown and vegetables are cooked tender. Stir in garlic, Old Bay Seasoning, dried thyme, and red pepper flakes. Cook for one minute, stirring constantly. Add white wine vinegar to the pan and stir, scraping up any browned bits. Cook, stirring occasionally, until the vinegar has almost completely evaporated. Pour in the dry white wine. Cook, stirring occasionally, until the wine has almost completely evaporated and the liquid appears syrupy. Stir in the crab juice, the cream, and the almond milk. Bring mixture to a simmer over medium heat, then turn heat to low. Simmer until the mixture thickens. Add crab meat and simmer 2-3 more minutes to heat crab throughout. Remove from heat and stir in chives. this looks so delish – i have to try it before it gets warm in the northeast because after that its all about warm weather foods for me! Thanks so much! It’s already getting warm in the southeast. Temps reached 80ºF today! Thanks for checking out our recipe! We have loads of other low-carb recipes on our blog as well. We try to make eating low-carb enjoyable. This looks so good! I love that you use cauliflower in it! Thanks, Lauren. Cauliflower has become my new favorite veggie. Holy smokes this sounds and looks incredible! Thanks for sharing! 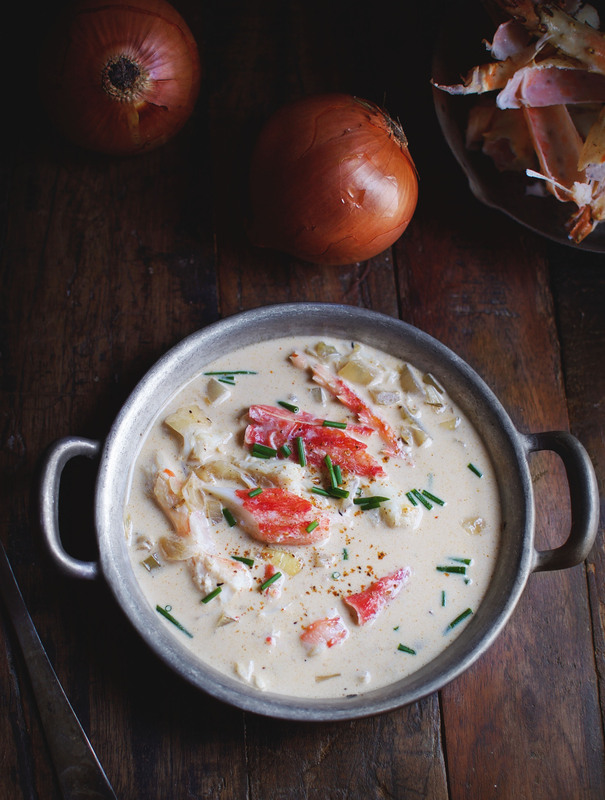 This looks like a fantastic chowder! Crab is one of my favorites, and this highlights it so well! Yum! Thanks so much, Leah! Crab is one of our favorites too! Yum! I have to try this one, love that it is low carb. So smart. Just made this, it was delish! My daughter thought she bit into a potato I had to tell her it was cauliflower, she was amazed! I also threw in 2 tablespoons of almond flour to thicken a bit. Great recipe, will def. make again. Thanks! I’m so glad you enjoyed it! I love how cauliflower is the great imposter! Hi – am I missing something? I don’t see when the crab gets added. I assume at the end, but I’m such a novice cook that I don’t want to rely on my assumptions! The vegetables and wine are on the stove now and it smells delicious! Can’t wait for the finished soup! Thank you! Never mind! I just saw the last part. For some reason that wasn’t showing up on my pinned post. No problem! Thanks for checking. I proofread my own work, so occasionally I do miss a mistake. I hope you enjoy the chowder! I made this for the first time and thought it was phenomenal. I paired It with some homemade cheddar bay biscuits and couldn’t get enough. Kids thought it was a little spicy so I’ll probably leave out the red pepper flakes next time. Thanks so much for your feedback, Tonya. 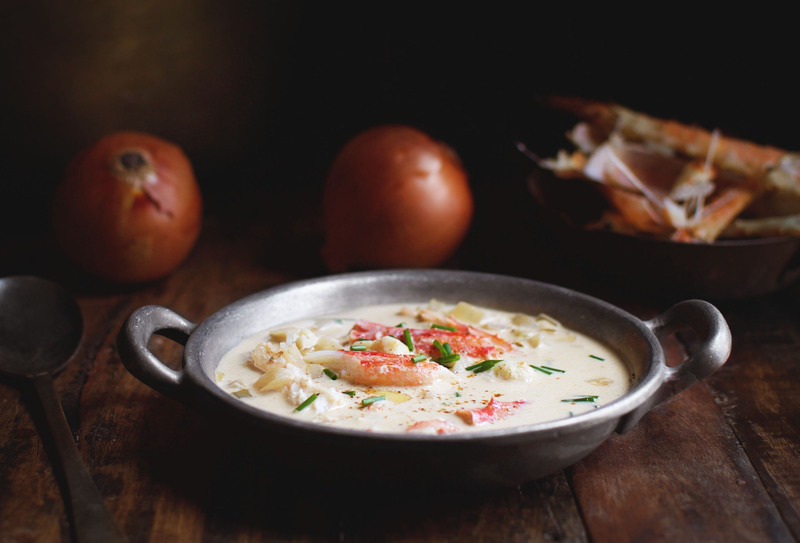 This chowder is one of my favorite soups! Here in England we do not have clam juice. What could be used instead of??? Instead of clam juice, you could make a stock out of the crab shells. In fact, the clam juice is really an easy way out of using the stock. To make crab stock, just put the shells in a pot; add an onion cut in quarters, a carrot cut into large chunks, a stalk of celery, a bay leaf, and a few peppercorns. Add water to cover, then bring to a simmer. Cover and simmer for an hour or two on low heat. Strain and use instead of the stock. Almost any type of milk could be used. The coconut milk in the carton might be a good choice because it’s not too coconut flavored. Just be sure it’s not sweetened or vanilla flavored. Could I use your recipe and go with all clams for a clam chowder vs a crab soup. I thought about adding a little bacon also. What do you think? Sounds delicious! Go for it! It turned out delicious. I only had riced cauliflower when I made it but it was perfect. So yummy! Thank you. Thanks for checking out our site! I’m so glad you enjoyed it! Very tasty! The whole family enjoyed it. I added more seafood than just the crab and the result was great! I love it when my recipes are a hit with everyone in the family! Thanks for the feedback! this was absolutely fantastic. i doubled the red pepper and added about 1/2 tsp of oat fiber to thicken. this is one of my favorites now! I’m so glad you liked it! It always makes my day when one of my recipes becomes a favorite! This was amazeballs! Only change I made was a DIY Old Bay seasoning (googled it) cause I couldn’t get it in regular Australian shops. So so yummy even on a hot summer day. Thank you!!! Thanks you for the awesome review! I didn’t realize that Old Bay wasn’t available internationally. Glad you found a DIY version. I provide the nutritional information as a courtesy to my followers. I try to make it as correct as possible. If nutritional information is super-important to you, I do always recommend that you also do your own calculations using the brands of items you use as they can vary. Also, some calculators can have wildly incorrect information on some of the products, so that may be why our numbers were not similar. I want to make this but the idea of clam juice really turns my stomach. If I omit it, I assume it won’t be very seafood-y?? You could probably substitute low salt chicken broth, but yes, it will be less seafood-y. Hubby made this tonight and added clams. Thank you so much for posting this,it was so amazing. This will become a staple in our house. Amazing soup perfect on this rainy cool night. Hubby LOVED it. Would like to try with shrimp or clams. Thank you for a wonderful keto friendly dinner. You’re welcome! I think it would be delicious with any type of seafood. I haven’t tested the recipe this way, but I think it would still work. You will need to add some type of oil to use instead of the bacon fat for sautéing the veggies. You could add shrimp before adding the crab. Use small peeled and deveined shrimp.They cook really fast, so let them simmer 3-4 minutes, or until opaque. If you use precooked shrimp, add them with the crab. This was absolutely delicious. Made with sweet Maine crab meat… couldn’t have been better.